This small poor island economy has become increasingly dependent on cocoa since independence 25 years ago. However, cocoa production has substantially declined because of drought and mismanagement. The resulting shortage of cocoa for export has created a persistent balance-of-payments problem. 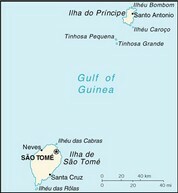 Sao Tome has to import all fuels, most manufactured goods, consumer goods, and a significant amount of food. Over the years, it has been unable to service its external debt and has had to depend on concessional aid and debt rescheduling. Sao Tome benefited from $200 million in debt relief in December 2000 under the Highly Indebted Poor Countries (HIPC) program. Considerable potential exists for development of a tourist industry, and the government has taken steps to expand facilities in recent years. The government also has attempted to reduce price controls and subsidies, but economic growth has remained sluggish. Sao Tome is also optimistic that significant petroleum discoveries are forthcoming in its territorial waters in the oil-rich waters of the Gulf of Guinea. Corruption scandals continue to weaken the economy. At the same time, progress in the economic reform program has attracted international financial institutions' support, and GDP growth will likely rise to at least 4% in 2001-02. The coffee production of the islands is small. Only about 1,000 bags of coffee are exported per year. However, they are of a exquisite quality. The coffee from Sao Tome and Principe combines a full-bodied, mellow flavor with a discrete but delicate sweetness. The flavor is very balanced and has a gentle smoky aftertaste.